AFTER A MASS exodus of Rohingya Muslims sparked allegations of ethnic cleansing, Myanmar leader Aung San Suu Kyi has said her country does not fear international scrutiny. She told the world that even with an estimated 412,000 Rohingya fleeing to Bangladesh in less than a month as their villages burned and hundreds were killed, the “great majority” of Muslims within the conflict zone stayed and that “more than 50% of their villages were intact”. The Nobel Peace laureate’s global image has been damaged by violence since Rohingya insurgents attacked Myanmar security forces on 25 August. The Rohingya community fled their villages in the military crackdown that followed. Many of their villages were in flames when they left. The government has blamed the Rohingya themselves, but members of the persecuted minority have said soldiers and Buddhist mobs attacked them. Suu Kyi told foreign diplomats gathered for her speech in Naypyitaw, the capital, that the government was working to restore normalcy in the area. Though fires have continued to flare in recent days in northern Rakhine state, home to most Rohingya, she said “there has been no armed clashes and there have been no clearance operations” since 5 September. 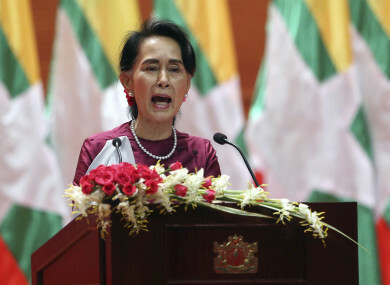 “Nevertheless we are concerned to hear that numbers of Muslims are fleeing across the border to Bangladesh,” she said. We want to understand why this exodus is happening. We would like to talk to those who have fled as well as those who have stayed. She said she it would be helpful to understand why conflict did not break out everywhere. She invited the diplomats to visit villages that weren’t affected so they could learn along with the government “why are they not at each other’s throats in these particular areas”. In the Kutupalong refugee camp, Abdul Hafiz said Rohingya once trusted Suu Kyi more than the military that not only ruled for half a century before but also held her under house arrest for many years. Now, Hafiz called Suu Kyi a “liar” and says Rohingya are suffering more than ever. He said Suu Kyi should give international journalists more access to their destroyed villages. If Rohingya are proven wrong that they were attacked, he said, “we will not mind if the world decides to kill us all by pushing us into the sea”. The Rohingya have had a long and troubled history in Myanmar, where many of the country’s 60 million people look at them with disdain. Though members of the long-persecuted religious minority first arrived generations ago, they were stripped of their citizenship in 1982, denying them almost all rights and rendering them stateless. They cannot travel freely, practice their religion, or work as teachers or doctors, and they have little access to medical care, food or education. Email “Rohingya crisis: Suu Kyi defends Myanmar against international criticism”. Feedback on “Rohingya crisis: Suu Kyi defends Myanmar against international criticism”.